At stake is just how much distributed energy a utility should be allowed to own. It’s a familiar narrative: Hopeful energy modernization advocate tries to reduce grid costs with distributed energy resources, only to get pushback from skeptics and an energy company worried about its bottom line. This time, in New Hampshire, the roles are all flipped around. Liberty Utilities is seeking approval for a 1,000-unit customer-sited battery pilot, to prove out the notion that distributed assets can help customers while averting more expensive traditional infrastructure investments. Liberty seems to have drunk the grid modernization Kool-Aid. Its filing, by senior analyst Heather Tebbetts, cites the rise of Amazon and Netflix to suggest the grid needs to update, and fast. “Electric utilities that do not address these emerging customer needs will be left behind like the landline phone companies [with] millions of dollars in costs associated with poles and wires with a declining number of customers taking service,” the filing asserts, sounding more like Sunrun than a regulated utility. This time around, Sunrun, a leading distributed energy advocate in many state policy discussions, is arguing that the pilot as proposed should be halted or drastically scaled down. And the regulator’s staff, rather than encouraging the utility to try innovative cost-cutting techniques, has voiced skepticism about the technical abilities of the program to accurately predict peaks and deliver enough capacity to deal with them. At stake is just how much distributed energy a utility should be allowed to own without jeopardizing competitive market dynamics. 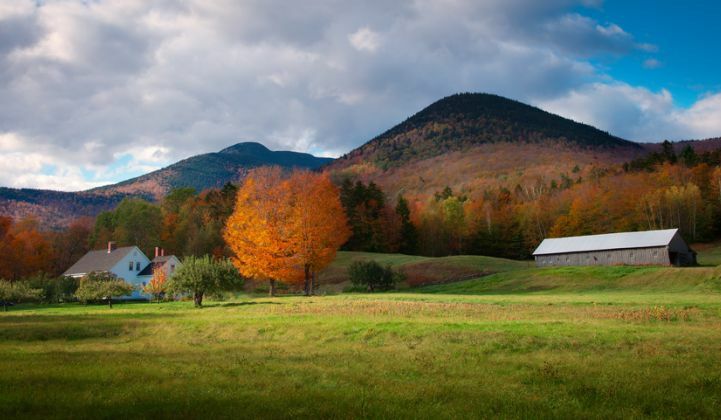 The New Hampshire pilot could become a progressive model for other states to follow, or a new hotspot in the long-simmering tension between home solar companies and utilities. Liberty Utilities wants to own and install 1,000 Powerwalls from Tesla — the vendor selected by an outside consultant based on the needs of the program — in the homes of its customers. Those residents would switch to the state’s first modern residential time-of-use rate. The host customers would pay a monthly fee or an upfront sum for backup power and the ability to toggle their consumption to optimize the rate structure. When the utility predicts a period of peak demand for the next day, it takes control of the batteries. Collectively, 5 megawatts of aggregated battery capacity would allow the utility to reduce its coincident peak, saving an estimated $693,000 a year in transmission costs and potentially offsetting traditional wires upgrades. The company thinks the pilot will “save costs and simultaneously build a more resilient and modern distribution system” for its 44,000 customers. It asked regulators for permission to put the costs of the program in the rate base. The plan resembles an earlier program at Vermont’s Green Mountain Power that lets customers pay $15 a month to host a utility-owned and -operated Powerwall in exchange for backup power. Nearly a year in, only 180 customers had signed up, perhaps because of the limited payback for the cost: Customers only benefit if they lose power; they don't get an economic benefit from operating the battery normally. The New Hampshire program sweetens the financial incentives by including the time-of-use element. Liberty hopes to get approval so it can enroll customers this summer and begin installations by November. To do so, it will have to assuage some technical concerns raised by PUC utility analyst Kurt Demmer. Demmer, incidentally, used to work at Liberty as director of electrical operations. He left in November 2016, and joined the NHPUC as a senior analyst in July 2017, according to his LinkedIn page. The Office of the Consumer Advocate has taken a more optimistic approach. Huber's testimony specifically commended the price signals in the TOU rates, the inclusion of a distribution non-wires alternative and the early embrace of residential storage, which has seen limited deployment nationwide but has grown rapidly in recent months. The real elephant in the room, at least for distributed energy companies, is that utility ownership bit. If you were, say, Sunrun, and you make money by leasing storage to homeowners, the notion of a utility buying a 1,000 Tesla Powerwalls and sticking them in people’s houses might prove alarming. Sunrun, which already sells in the New Hampshire market, did find this alarming. The residential installer filed comments to push for a “bring your own device” program instead of the utility-owned pilot. If the PUC goes forward with the utility-owned model, the program should shrink to 25 percent of its proposed size, the filing argued. The problem for Sunrun is that as proposed, only Liberty customers on the pilot could access the potential savings associated with the time-of-use rate. While pilot participants get to nimbly dodge their own peaks and keep the bill savings, customers who buy their own device from third parties will have no incentive besides the insurance that comes with clean backup power. “Liberty should be commended for endorsing local, in-home technology like solar and batteries to solve for large-scale utility and regional grid issues," Sunrun Northeast Public Policy Director Chris Rauscher told GTM. "But let’s allow free-market competition to drive innovation forward and put consumers at the center of energy solutions." The stakes are high, he said, both for public perception of DER programs in general and for the future of distributed energy in New Hampshire. "This proposal would completely stall out the home battery storage market in the state due to preferential utility access to customers, among other things," Rauscher said. "This would destroy competition and unfairly stunt the growth of local companies." Before making those arguments, Sunrun tried to supply the pilot as a virtual power plant provider. Earlier in the process, Sunrun sent Liberty an out-of-docket proposal to sell the utility the rights to use batteries owned and operated by Sunrun, Tebbetts said. * The utility didn't go that route for technical reasons, including pricing and battery capacity. Sunrun, she added, has been "wonderful to deal with," and she agrees with the company on the big conceptual points. "There’s absolutely a role for third parties to put batteries in customer homes," Tebbetts told me. "The utility doesn’t have to own everything." Furthermore, she's on board with opening up time-of-use rates to all customers. Doing so would require a more involved regulatory process tied to a rate case, so it's beyond the scope of the current proceeding. More importantly, she wants to use the pilot to test the rates at a small scale before introducing them systemwide. "We want to understand our customers' needs and wants and concerns before we roll out something like that," Tebbetts said. Going forward, Tebbetts hopes to work over the coming weeks to adapt the proposal such that all stakeholders can agree to it. That will involve some logistical improvements, like nailing down the algorithm that will predict the peaks, a key part of successful program execution. The consumer advocate recommended that the PUC open a generic statewide docket to design a third-party battery program. That might placate the other providers' concerns that the utility-owned pilot would scuttle competitive markets. The exact details have yet to be worked out, but there's a plausible pathway for the utility to get what it wants and the third-party providers to get a program of their own. Either or both of those outcomes would put New Hampshire on the national map for use of distributed batteries to serve grid needs. *The story previously quoted Tebbetts saying that Sunrun offered to sell batteries to the utility. She later clarified that the proposal was to sell the services of the batteries to the utility. The story has been updated to reflect that.